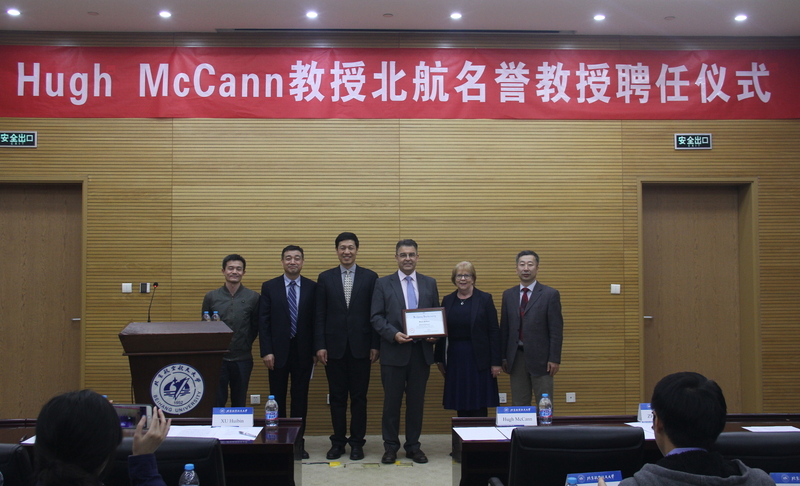 Professor Hugh McCann and his wife Margaret visited Beijing in October 2018, as guests of Beihang University and of North China Electric Power University (NCEPU). To participate in the 60th anniversary celebrations of the foundation of NCEPU, Hugh was invited to Beijing to present a special lecture, which he entitled “100 Years of Tomography: We are ALL super-human now!”. Over 100 staff and research students attended, and participated in a stimulating Q&A discussion afterwards. Hugh also made a plenary presentation on “Tomography in Engines” to the 2018 Annual Conference of the Chinese Society for Electrical Engineering, CSEE, which was hosted by NCEPU as part of their celebrations. Hugh gave two hours of seminars to the research group of Professor Liu Shi, with whom he has a long-standing research connection. He also discussed in detail many of the on-going projects in the NCEPU group. In a separate ceremony the following week, the President of Beihang University, Professor Xu Huibin, conferred upon Hugh the title of Honorary Professor in recognition of his achievements in the field of Agile Tomography. The ceremony was attended by 70 staff and students from Beihang and several other universities. In his acceptance speech, Hugh noted the excellence and intensity of engineering education and research at Beihang, with over 15,000 engineering students. He then presented a version of the special lecture above, in which he noted the contributions of Beihang University, as well as those of several eminent Chinese researchers in the field. The following day, Hugh presented a separate research seminar to the research group led by Professor Xu Lijun, Dean of the School of Instrumentation Science and Opto-electronics Engineering, and visited the group’s laboratories. Hugh and his colleagues in the Agile Tomography research group in Edinburgh enjoy an intensive and fruitful collaboration with the Beihang group, which will be enhanced by the Honorary appointment.